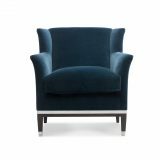 The most comfortable chair we handmake, except unlike our standard Regent Armchair, this one has a softly buttoned back.. Great seat position and the sloping seam stitched arms provide perfect positioning for your elbows. The angle of the back creates unrivalled comfort. 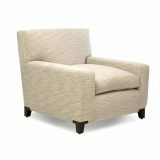 The back is softly upholstered over springing and the seat has a feather and down cushion. You also have a choice of over 30 wood finishes to choose from or we can match to your colour or finish sample. A sublime chair to sit in, very popular with clients as they seem to come back time and time again to order another one. To ask a question about the Regent Buttoned Armchair click here. We'll email you the answer as soon as possible. If you have a question about the Regent Buttoned Armchair, fill in the form below and we'll email you the answer as soon as possible.